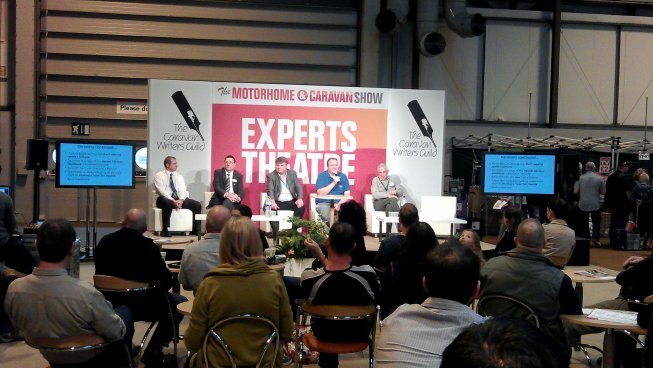 The Guild was delighted to acccept an invitation from NCC Events to organise the Expert Theatre sessions at their first ever show, the prestigious national Motorhome & Caravan show at the NEC in October. It was the first time the Guild had done anything like this and we were determined to make a success of it. A total of 31 keynote speakers and panellists supported two sessions per day across the six days of the show. All gave their time freely and were appreciated by a grateful public. It is estimated that the overall attendance across the twelve sessions was around 2,000 people with the Saturday afternoon session alone attracting some 400. All who took part said how much they enjoyed it and there is no doubt it was a great PR opportunity for the Guild. Watch this space!